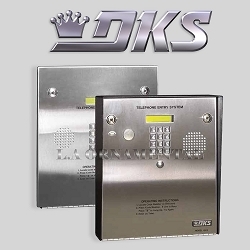 The Model 1833 is an ideal telephone entry and access control system that is suited for applications that do not require a directory or in applications where a separate directory exists. The easy to use Remote Account Manager programming software, card reader interface and expandability options make this unit an ideal choice for those applications with a large number of system users and entry locations. Up to 16 card readers can be interfaced with the 1833 to provide access control. Additionally, our elevator control module restricts which floors a guest or system users have access to, making it an ideal system for high rise buildings. For additional security, the 1833 allows you to monitor activity AS IT HAPPENS on your computer display and with our anti-pass back memory, you can enable a TRUE anti-pass back system in one of three different configurations; passive, active and trap. 31 security (permission levels), 29 programmable (2 fixed levels).